It's easy to operate，we keep the most important part to make the air quality monitor more efficient. It's convenient to carry, such as home, car and office. 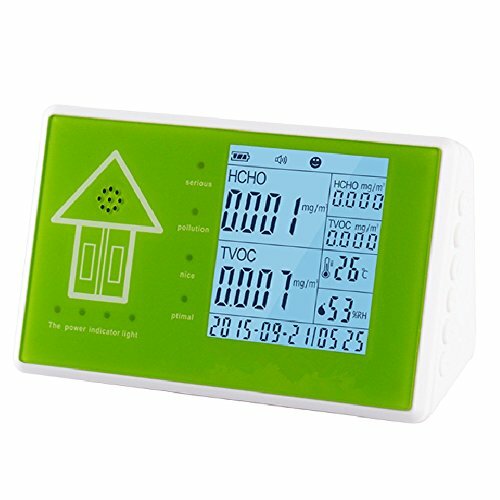 The contents displayed on the screen:TOVC, Formaldehyde, PM2.5,PM10, Methylbenzene(i's included in the TOVC test),Humidity,Temperature,average record,time,exceed the standard alarm. Tips: After using this detector boot need 120 seconds is timing monitor preheating process, users need to be patient. Preheating is limited to HCHO/TVOC sensor. After the first use the boot after 120 seconds preheating,such as testing data on the high side,floating up and down,0.000 or 000 belongs to the normal,please move the monitor to the air flow is benefit or air quality good place 1-3 hours, monitor returned to normal after safety data is used,also can be manual calibration instrument or instrument data reset after use. 【MULTI-FUNCTION】Anytime anywhere Tracking TOVC, Formaldehyde, PM2.5,PM10, Methylbenzene(it's included in the TOVC test),Humidity,Temperature will give you a sense of security.In addition,average record,time,exceed the standard alarm display on the display screen. A total of 10 functions. 【ADVANCED CHIPS】The detector uses imported sensors and chips with high accuracy, good stability and a truly accurate resolution of 0.001 mg/m3. 【EASY TO OPERATE】It's easy to use with simple system settings.and switch function just one click;the operation is convenient and practical,is indispensable to quality household air quality monitor. 【NEW DESIGN】Simple design,generous and elegant;the fuselage line is fluent,exquisitely meficulous with 6 function buttons make the testing more accurate and useful. 【EASY TO CARRY】Suitable to use at home, office, in the car ,outdoor and other environmental testing. If you have any questions about this product by Umootek, contact us by completing and submitting the form below. If you are looking for a specif part number, please include it with your message.